In our English Language Development (ELD) program, our teachers work with students to improve their English skills, especially with our students who are learning English as a second language. Our ELD program is meant to inspire our students, helping them communicate more effectively through oral and written communication. 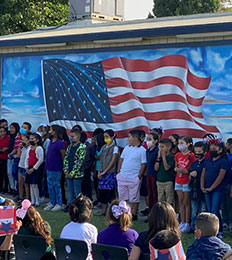 We value our ELD program because we know that improving students’ English will also improve comprehension capabilities and set the stage for a more successful academic experience. Learning does not have to begin and end during school hours. We offer an after-school program for those in need of more individualized attention or students looking for a more challenging curriculum. Please contact RAC at (559) 992.5171 to learn more about our after-school program. Through our One2One program, our students use Apple products to facilitate an “anytime, anywhere” learning environment. We see technology as a valuable tool that, when used appropriately, has tremendous potential for advancing the education of our elementary students. For more information about our award-winning technology methods, please visit the One2One Program page. Please utilize the information below to help give your children a little extra practice in our core curriculum.